MANILA, Philippines – LET RESULT here. 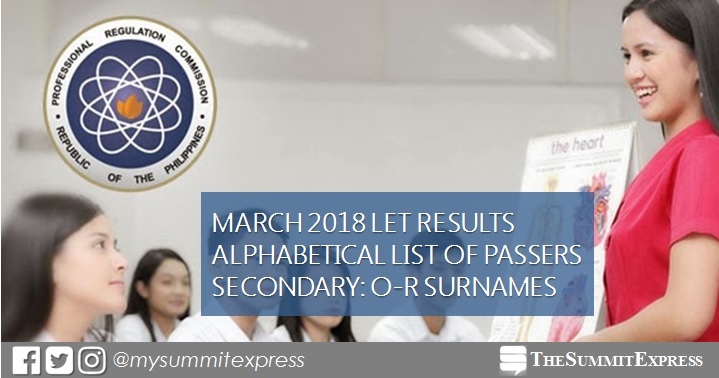 The Professional Regulation Commission (PRC) and the Board of Professional Teacher (BPT) officially released on Wednesday, May 23, the full results of teachers board exam (LET) conducted on March 25, 2018 (Sunday) in at least 20 test centers nationwide. PRC announced that 22,936 secondary teachers out of 76,673 examinees (29.91%) successfully passed the LET. It is further announced that 15,035 passers are first timers and 7,901 are repeaters. The BPT who gave the licensure exam is composed of Dr. Rosita L. Navarro, Chairman; Dr. Paz I. Lucido, Dr. Paraluman R. Giron and Dr. Nora M. Uy, Members. The list of secondary teachers, who successfully passed the LET will be posted here once available online. Takers may check on this page the alphabetical roll of passers for O to R Surnames. Note that passing the LET and having valid professional license from the Commission are necessary before the practice of teaching profession in the country. Otherwise, those who will violate may face fine and imprisonment based on penal provisions. 5) 1 piece short brown envelope. According to PRC Resolution No. 2017-1068, the target release date of March 2018 LET board exam results is on Tuesday, May 22, 2018 or in 37 working days after the exam. Note that results may be released ahead or beyond the target without prior notice. On May 19, review center owner Carl Balita hinted: "When the sum of the day equals with the month, God will LET DREAM and the DREAMER be ONE." This can be equated to May 23 (2+3=5, 5 is the 5th month of the calendar). Monitor this page for the real-time updates on Teacher board exam results. Check out also the official website of PRC for more information.